Better late than never, that’s my opinion :) Sorry it took me so long to get this summary up. 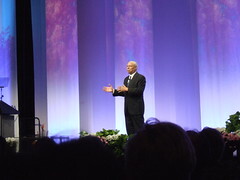 The keynote talk at SLA 2009 in Washington, DC was made by Colin Powell and I must say it was better than I thought it would be!! :) I need to start by mentioning that my notes will seem like they’re all over the place- but that’s because Colin kept changing directions in his talk (which is what made it so interesting). 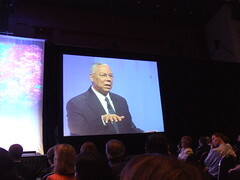 Colin Powell has his own librarians for his special collection. He often sends question to his librarian like – “Do you have a picture of me at age 6″ or “Did I ever say this to anyone?” And even though he pissed us (librarians) off by telling people to go to their offices and throw out their research materials and their books a few years ago – he didn’t mean that he didn’t appreciate librarians and what they did – he did it because he had to make a point – things had changed since his staff had started working – and it was time to catch up with technology. Colin said, “We had to change because we’re in a new world – in a world of information explosion – information that needed to be turned into knowledge” – and his staff had to understand that all the boundaries that existed years ago were gone – and he wanted them to move faster and faster – he wanted them to get online. He asked how can we be an up-to-date organization if the stuff on our website is 2 or 3 years old (he was talking about the state department – but I bet we can find some libraries like this too) – it is a transactional world – it’s no longer a lunar world – we don’t measure in months, years, etc – we measure in transactions. He said “I want to beat Google, i want to beat the CIA – I want to be faster and better” – but his staff kept saying we like the old way – updating once a month – or once a year. His favorite example to give people about the power of the Internet is a time when someone called and complained about a resolution to the UN. While his colleague was on the phone with him explaining his problem Colin didn’t visit his own site – instead he went to Google – it took him 1 second to find the resolution in question and help the man on the other line. You have to move at the speed of light – you have to be faster than anyone else in the world we’re living in if you’re going to succeed. He then mentioned Clay Shirky’s Here comes everybody (a book that is still sitting on my wishlist). In the book, Clay mentions that in the old days you got a group together by sending flyers – or calling – but doing all that costs money – but now with the power of the information revolution and the technology we have – the cost of adding people to a group or assembling people is zero. An example of this would be the Flash Mobs that you can find videos of on YouTube. That said, it’s not just Google that’s making us faster, it’s YouTube, Facebook, Twitter, etc. He mentioned that his 14-year-old grandchild was born digital whereas he’s analog and got himself a $59 converter to become digital :) His grandchild was 4 1/2 before he would sit to have a book read to him – but he knew how to use the computer at 3. His grandkids won’t answer emails or the phone – he has to tweet or text message them to get them to respond. This is what we’ve been hearing from reports left and right about digital natives. Much to the dismay of librarians all over (who think Google is evil) Colin mentioned that he looked at SLA’s ClickU, but instead of navigating through the SLA site, he just went to Google. He said he doesn’t use bookmarks anymore because Google knows everything. He said, “I’m peddling as fast as I can to keep up with this stuff – it’s exciting and it’s fascinating” – but what does it mean to us as librarians? SLA may have had the same title for 100 years – but the association is not the same – we are now working in the electronic world – people want to be able to work at the speed of light and what we do is so important because we keep our companies and businesses informed. He talked about the flattening of the world. We’re competing in everything – students don’t need to come to America for superior education anymore – they can get it elsewhere. People aren’t coming to our medical facilities – cause there are great services all over – it’s a flat world. That said, he wants people to come here and stay here – to study because they learn about us – they learn that we’re not a Hollywood sitcom or a Michael Moore book. He told us to remember that the followers always get the work done – in order to get that work done you have to give the people who work for you a sense of purpose – and that has to come from the leader – and it has to come from a leader or who is passionate – and infectious and they have to see that passion coming out of the leader – you can’t just talk the talk – you have to walk it – you have to invest in your people – that’s why he bought those computers – leaders have to give followers the tools to get the job done – leaders have to compliment – a simple handshake or a handwritten note – it means the world – people thrive on this simple kind of attention – when you show them that you believe in them. A leader also has to be able to prune the organization – because the good followers know who the bad ones are and they’re waiting for a leader to do something. He mentioned that it may look like nothing is going right in the world right now – but a lot is going right – we just don’t think about it right. More people are living under democracies than ever before – we have fewer enemies – we are now working with many countries that were once our enemies (Russia, China). In short, he thinks this is a time of great opportunity. 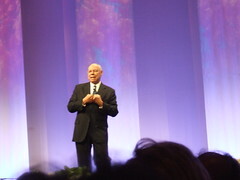 Overall an amazing talk and such an energetic man. I’m very happy that I got to be there for that talk!! Nice write up. I'm curious though: did he not say anything about the use and misuse of privileged knowledge during his time in the Bush Administration? I think Powell's a good and impressive man, but I feel like he has some credibility issues with information professionals. Thanks! Nope, he didn't say anything about that. The guy on the other end of the phone line about the UN resolutaion was Igor Ivanov (http://en.wikipedia.org/wiki/Igor_Ivanov)! Thanks for the great notes - I didn't really manage to get anything down.